There’s a South African flavour to the Barbarians XV this weekend. Crockett won 71 caps for the All Blacks. 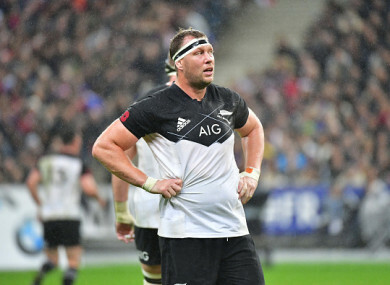 PROP WYATT CROCKETT will captain the Barbarians against Argentina in London this weekend, while South African trio Handre Pollard, Pieter-Steph du Toit and Schalk Brits have all been named in the XV. Crockett, who won 71 caps with the All Blacks and was part of the squad that won the Rugby World Cup in 2015, announced his retirement from international rugby earlier this year but will lead out the Baa-Baas at Twickenham on Saturday. Eight South Africans are in the starting line-up, including Damian de Allende, Aphiwe Dyantyi, Siya Kolisi, Pollard and Du Toit — all of whom started in the Springboks’ loss to Wales last weekend. It will be just the third time the Barbarians have faced Argentina in their entire 128-year history, with each team winning one of the previous meetings. Email “All Black Crockett to skipper Barbarians against Pumas at Twickenham”. Feedback on “All Black Crockett to skipper Barbarians against Pumas at Twickenham”.